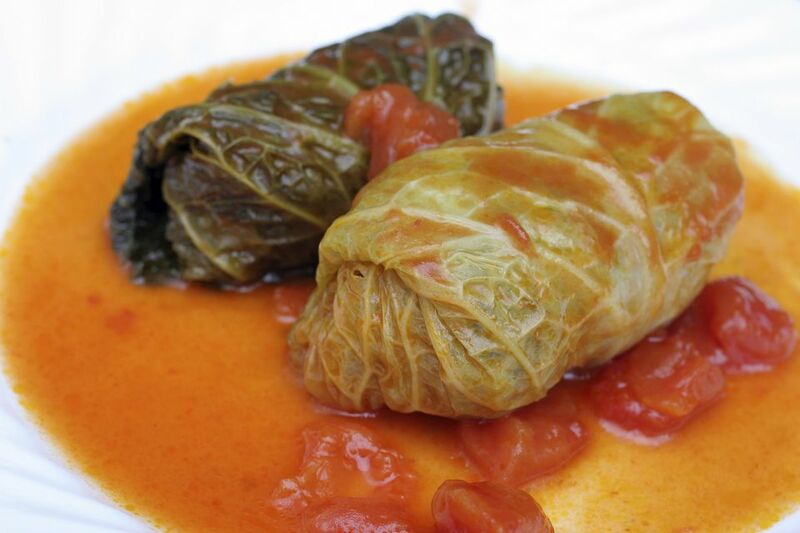 This recipe for Croatian stuffed cabbage or sarma is from Klara Cvitanovich. She is the owner with her husband and son, Drago and Tommy Cvitanovich, of Drago's Seafood Restaurant in New Orleans and Metairie, La. While Eastern European foods are not on the menu at the family restaurant (see the recipe for Drago's charbroiled oysters), Klara still cooks the foods of her beloved Dubrovnik, Croatia, at home, especially for Christmas. Traditional Croatian Apple Strudel is also a classic addition. This recipe makes enough for a crowd, and since they taste even better the next day and the day after, you'll have tasty leftovers! Place onions, bacon, and garlic in a food processor and finely chop. In a very large Dutch oven or roaster, saute onion-bacon-garlic mixture. Meanwhile, finely chop the celery and parsley in the food processor and add to the onion-bacon-garlic mixture along with the beef, pork, and veal. Cook until meat is evenly browned. Remove from heat and, if desired, drain off excess fat. Allow it to cool. Heat oven to 500 degrees. If the inner leaves of the cabbage heads aren't pliable, return them to the boiling water for a few minutes. Trim the thick center vein of each leaf without piercing it. Add rice to meat mixture, and season with cinnamon, nutmeg, paprika, and salt. Mix in eggs thoroughly. Place a handful of meat filling on each leaf. Flip up the bottom, then fold the sides in, and roll up. Any leftover filling can be frozen for later use. Chop the reserved cabbage hearts and, in a large bowl, mix with sauerkraut and tomato puree. Season the dish with salt and pepper. Place some of this mixture on the bottom of a deep, large roasting pan. Cover with a layer of cabbage rolls, tightly packed. Press down and spoon on more sauerkraut mixture. Add another layer of cabbage rolls, running at a right angle to the first layer. Continue in this manner until all the cabbage rolls are in the pan—top with remaining sauerkraut mixture and pour some of the tomato juice over it. Gently shake the pan to distribute the juice and add the rest of the tomato juice. Sprinkle with sugar and cloves. Cover and place in a 500-degree oven. When the mixture comes to a boil, reduce the heat to 350 degrees and bake 2 1/2 hours. Remove cloves before serving. Present two or three cabbage rolls per person with boiled potatoes and some of the sauerkraut mixture, and sprinkle with chopped parsley and paprika. Cooked stuffed cabbage will keep a long time in the freezer if they are well sealed.